Informtainment.com by ORLANDO: Oldest Bible Online! The British government bought most of the pages of the ancient manuscript in 1933. Discovered in a monastery in the Sinai desert in Egypt more than 160 years ago, the handwritten Codex Sinaiticus includes two books that are not part of the official New Testament and at least seven books that are not in the Old Testament. The New Testament books are in a different order, and include numerous handwritten corrections -- some made as much as 800 years after the texts were written, according to scholars who worked on the project of putting the Bible online. The changes range from the alteration of a single letter to the insertion of whole sentences. And some familiar -- very important -- passages are missing, including verses dealing with the resurrection of Jesus, they said. 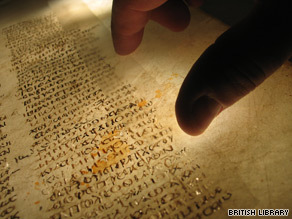 Juan Garces, the British Library project curator, said it should be no surprise that the ancient text is not quite the same as the modern one, since the Bible has developed and changed over the years. "The Bible as an inspirational text has a history," he told CNN. "There are certainly theological questions linked to this," he said. "Everybody should be encouraged to investigate for themselves." That is part of the reason for putting the Bible online, said Garces, who is both a Biblical scholar and a computer scientist.